With the most recent progress in fast data processing on smart scalable parallel hardware architectures imaging techniques have reached the capability of being employed as sensors in advanced real-time control systems. Process tomography techniques are of particular value as they can give insights into opaque process components and materials. 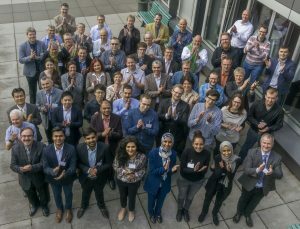 The European Training Network “Smart tomographic sensors for advanced industrial process control (TOMOCON)” joins 12 international academic institutions and 15 industry partners, who work together in the emerging field of industrial process control using smart tomographic sensors. The network shall lay the scientific and technological fundamentals of integrating imaging sensors into industrial processes and will demonstrate its functional feasibility on lab and pilot-scale applications. Our 15 doctoral researchers are being trained in the fields of process tomography hardware, software and algorithms, control systems theory and design, industrial process design, multi-physics modelling and simulation, human-computer interaction, and massive parallel data processing. Together with their supervisors and industry partners they are engaged in multi-disciplinary research on various tomographic imaging modalities, tomographic image processing as well as advanced multi-physics modelling of processes, sensors and actuators. Proof-of-principle demonstrations of tomography-based process control are being foreseen for important industrial processes, such as inline fluid separation, microwave drying of porous materials, continuous steel casting and ultrasound-controlled crystallization.